I watched Barcelona beat Ajax in the Champions League on Tuesday and it will be interesting to see how Luis Suarez fits into their forward line on Saturday. Barca's front three was Neymar on the left, Lionel Messi through the middle and Pedro on the right. Pedro did a really good job but I wonder if he would be the player to make way because you would think Suarez will start. Suarez can play on that side because he is that good a player. He would not be wide right anyhow because Ivan Rakitic seems to hold that position as well in front of Dani Alves. It is a pity that Gareth Bale is out for Real because otherwise it could be him, Cristiano Ronaldo and James Rodriguez against Messi, Suarez and Neymar. Mind you, it is mouth-watering enough anyway. Ronaldo and Messi are, if anything, better than last season. It is so hard to call but I would go for Real to edge it this time. From what I've seen of them, the only thing that will stop them becoming the first team to win back-to-back Champions Leagues this season is their defensive problems because they can still have a bad day, but you can get to Barca at the back too. If you are a football fan, you just sit and watch this game and enjoy it. As a neutral it is great because I am not too bothered who wins but I just know it will be full of absolutely everything - quality, intensity and lots of incident. It is becoming an unmissable event. 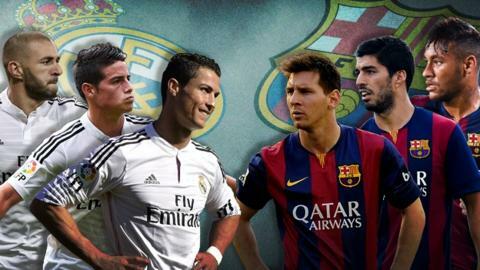 Read more on Real Madrid v Barcelona: The biggest game in club history? El Clasico: Did you know?